We’ve made some tweaks and enhancements to the design of AgencyBloc and added a few new things too. Below are the details for what was released. Working with and managing data in the insurance world can be an involved process. There are personal details, policy details, todos, dates, keeping track of commission payments, and the list goes on. We’ve heard there are some things we could do to make it easier to get to the information you need. With that in mind, we’ve made some updates to the design of AgencyBloc so you can see and act on important details at a glance. The update has the same basic feel you’re used to with some tweaks and a few new things. 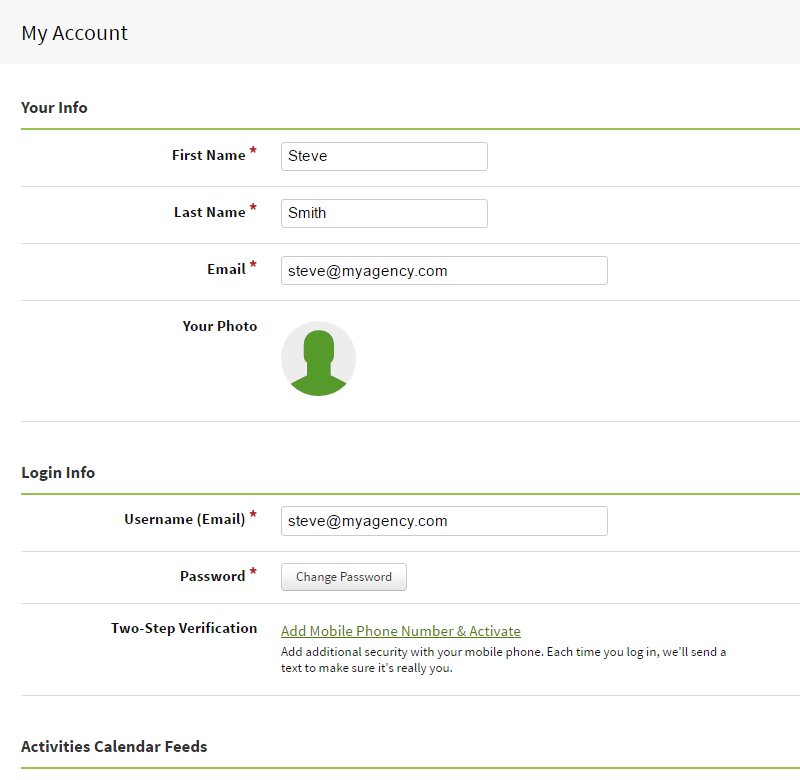 Each area in AgencyBloc contains a lot of data - you can track a great deal in AgencyBloc. With that, sometimes it can be a challenge to find that one piece of information you need or get a quick summary of the data. 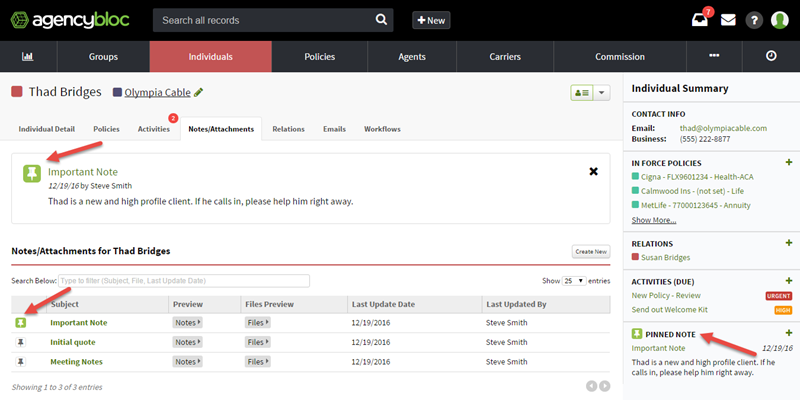 Now, you can see a summary of a record in each area of AgencyBloc - Groups, Individuals, Policies, Carriers, and Agents. Summaries include a list of information so you can see and act on important highlights at a glance. Each summary contains information unique to that area. Use it to view details at a glance, then from the summary area you can navigate to view more info. Use the + button to jump right to adding items on a record. View or add a pinned note to include on a summary (more details below). Summaries show by default for larger displays, but you can always hide it. When you hide the summary, the next time you look at a contact record in that area, the pane will remain hidden. If you have a smaller display or want to show the summary, click the Hide/Show icon to view the summary. In a list of notes and attachments, you might have one note that is more important or that you want everyone to see. To help with that, you can now pin a note. Pinning a note adds it to the top of the notes & attachments page and also includes it in the summary for quick reference. Add important reminders, documents, or information to pinned notes for quick access. To pin a note, click on the push pin icon. You can only pin one note and the push pin will be green to let you know which note has been pinned. In AgencyBloc, you can associate records to show the connection between records. You can associate an individual with a group or carrier if they are an important contact. Also, each policy in AgencyBloc is connected to a policyholder (a group or individual) and a carrier. We’ve made an update to better show the connection between records - you’ll now see each record and appropriate block showing how records are connected. To change an association, click the green pencil icon to edit or remove the association. We’ve updated My Account page to streamline the display. Now, items display so you can scroll through the page in a linear fashion to view or update details about your account. Check or update your BlocMail settings. Update your password or add two-step verification. Additionally, we cleaned up some labels so it’s clearer what each option does. With more and more apps and services available online, it is common to have multiple web browsers/tabs all open at the same time. You may have a carrier website open in one tab, your web email in another, and then AgencyBloc. We’ve updated AgencyBloc so you can see what page you’re viewing in the browser page title. So go ahead, open as many tabs as you’d like, you’ll see the name of the area or record so you know exactly where you left off. There has also been several other updates & tweak with this release. The print function has been updated to make it easier to print the page you are viewing or the whole record. Also, throughout AgencyBloc, we’ve updated several section headings to make the display cleaner. Additionally, we updated the display of fields in a few areas (Security Groups, User Settings, Reports) with a new layout. All of this to tidy up the display. One last thing, there is a new button in each main area to create a new record. Please let us know what you think. And, as always if you need anything, please let us know. We're here to help.